The Catland Chronicles: INTRODUCTION: BWAH HA HA HA HAH I GOT MY OWN BLOG (IF I SHARE)!!!! INTRODUCTION: BWAH HA HA HA HAH I GOT MY OWN BLOG (IF I SHARE)!!!! ABOUT THIS BLOG. HA HA the lady I live with said I would NEVER get a blog and I've got a blog! Right now I have to share with Sam and Lydia, but I bet pretty soon I'll have it all to myself! I am gonna OWN the blogosphere! But first the lady said I have to tell you about this blog. 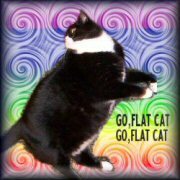 The lady said if she gave me a blog I had to, like, mention that this is just one blog that is the official kitty blog for THE FLATLAND ALMANACK which is a whole bunch of other blogs the lady has, like her clip-art gallery, her political blog, and a lot of other stuff, blah de blah bloggetty blog blog woohoo. THE FLATLAND ALMANACK lists new things she posts every day in all her blogs and she says I have to have links to it in the sidebar, which: whatever. So anyway if you want to see her other blogs, click on the links on the left yacketa yacketa yackety. Here we all are. 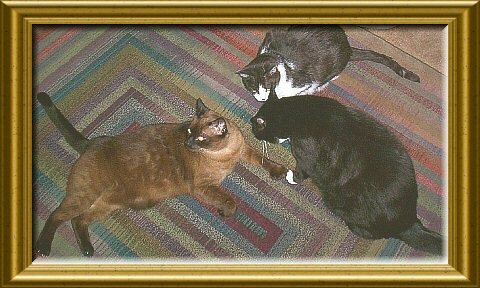 The lady picked this picture to make it look like we are all discussing blogging, but really we are just planning a diversion so the man will go in the kitchen and we can steal the catnip bag. Even Sam that everyone thinks is SUCH A SAINT was in on it. You can see from his ears and the way he is squinting that he was, like, the LEADER of stealing the catnip. He knocked over a whole gallon of water that the man had to mop up! Lydia (<enemy) is the other one. I hate her. Hi Flat Cat! I am glad you have a blog, even if you have to share it. I added you to my links so I can come back and visit you all the time. Because you are funny! Congratulations! :) Even though you have to share your blog, I'm very glad you finally have one! :) When I get a younger brother or sister, I'll have to share mine too. Hi Flat Cat and Sam and Lydia too. We are so happy to meet you. Please accept our heartfelt thank yous and purrs for TeaCup - we do so appreciate the thoughts and well wishes. Congratulations to your new blog ! I just wanted to inform you about bad news. Poor Arthur had his tail squeezed and now he is not allowed to go out anymore ! Come and visit him I think he would be happy then ! Hello there! Glad to meet you and I'm sure you're going to have a great time with your own blog! Hello everyone! Found you over at Dragonheart's comments. Welcome to our cat blogging community. Stop over and see us. Hi, Guys! We are so happy to meet all of you! We share a blog, too. It's not that bad, because some times, you just ain't got much to say, but one of the others might! I'm happy you now have a blog...sorry you have to share, but you are a funny one! HAHAHAHAHA! We win! My Mommy swore up and down, this way and that, that I would NEVER have a blog! Well guess what friend, I have one. She still have her blog where she talks about whatever strikes her fancy but it's mine that counts! I'm happy to meet you! Hi! All is fair in love and catnip bag gettin' I saw you over at Dragonheart's and wanted to say hi. I can't believe your bean lady would even consider having other blogs and not giving you one. Jeez. Well, looks like you win, as it should be! Hi there! You've got a great bloggie. Momma read the Thursday Thirteen on Flatland Almanack where your momma mentioned that youkitties blog, and I got excited and just had to see. I love meeting new kitties. I haven't met you guys before, but then the kitty blogosphere is a purr-etty big place. Great to meetchya! Hello Flat Cat! I've tagged you for the 7 random things about me meme. Welcome to the blogosphere, and it's only right for you to finally get your own blog. Enjoy it! Are you still participating at Cats on Tuesday ? Please let me know. Hi, it's quite a long time ago ! I am just checking the Cats on Tuesday blogroll and wonder if you will still participate. Please let me know !